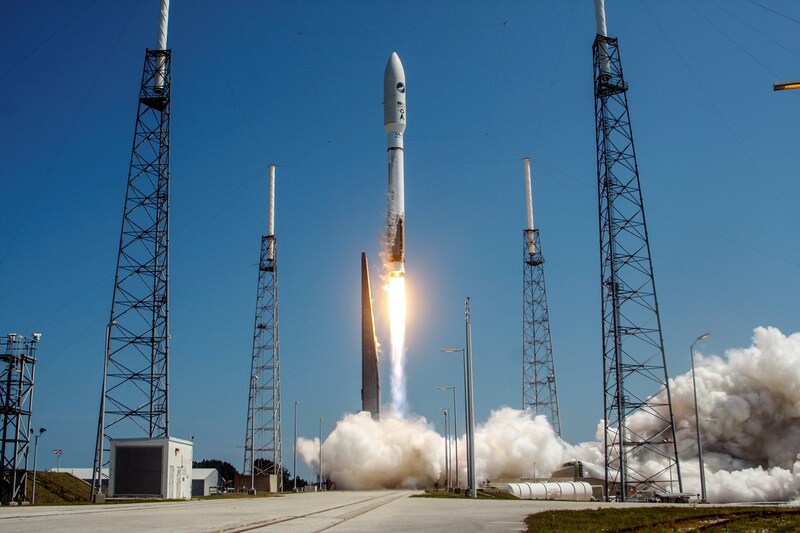 May 20, 2015 – A United Launch Alliance (ULA) Atlas V rocket successfully launched the Air Force Space Command 5 (AFSPC-5) satellite for the U.S. Air Force at 9:05 a.m. MDT today from Cape Canaveral Air Force Station, Florida. The Atlas V also carried the U.S. Air Force’s X-37B Orbital Test Vehicle (OTV) on its fourth mission. The X-37B experimental test program includes two spacecraft built by Boeing to demonstrate space technologies for the U.S. Air Force. Based on NASA’s X-37 design, the uncrewed OTV is designed for vertical launch to low Earth orbit altitudes where it can perform long-duration space technology experimentation and testing. Upon command from the ground, the OTV autonomously re-enters the atmosphere, descends and lands horizontally on a runway. The X-37B is the first vehicle since NASA’s shuttle orbiter with the ability to return experiments to Earth for further inspection and analysis and the X-37B can stay in space for much longer. Technologies being tested in the program include advanced guidance, navigation and control, thermal protection systems, avionics, high temperature structures and seals, conformed reusable insulation, lightweight electromechanical flight systems, and autonomous orbital flight, reentry and landing. Much of the testing performed by the X-37B is classified, and although the three prior flights have spanned more than three and a half years total, it’s unknown what their purpose was beyond testing the capability of the spacecraft itself. The Air Force hasn’t released much information about the current mission either, but NASA has announced that the space plane is carrying the Materials Exposure and Technology Innovation in Space (METIS) investigation that will expose approximately 100 different material samples to the space environment for the duration of the flight, which is expected to last more than 200 days. The OTV is also carrying an experimental electric propulsion thruster for the Air Force. This Atlas V mission also includes the Aft Bulkhead Carrier (ABC) carrying the National Reconnaissance Office’s (NRO’s) Ultra Lightweight Technology and Research Auxiliary Satellite (ULTRASat). ULTRASat is composed of 10 CubeSats managed by the NRO and NASA. “The CubeSats were developed by the U.S Naval Academy, the Aerospace Corporation, Air Force Research Laboratory, The Planetary Society and California Polytechnic, San Luis Obispo to conduct various on orbit experiments” said Sponnick. The cube-shaped satellites measure about four inches on each side, have a volume of about one quart and weigh less than three pounds each. Individual CubeSat research projects may address science, exploration, technology development or education. 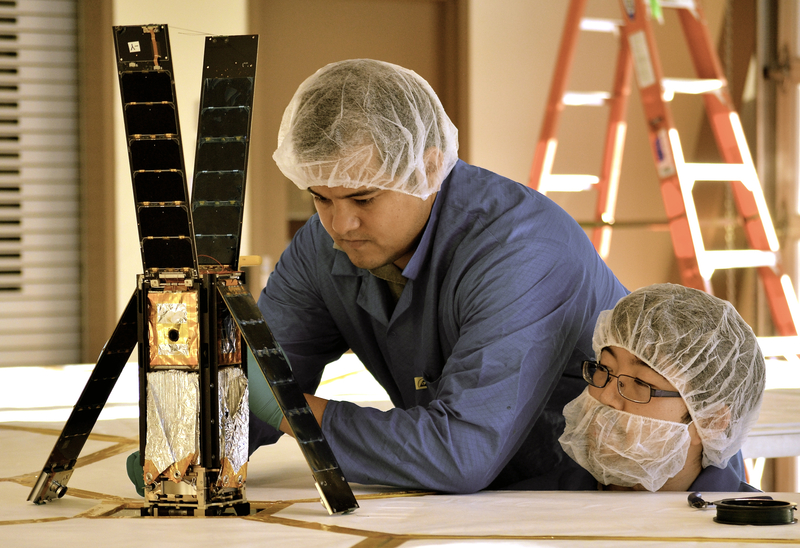 CubeSats have made low-cost space missions a reality for universities and research groups. However, providing propulsion for these tiny satellites has been a challenge. The Planetary Society’s LightSail satellite consists of three CubeSats bundled together to demonstrate the viability of solar sailing for CubeSats. Solar sailing works by using sunlight for propulsion. When solar photons strike LightSail’s reflective Mylar sails, their momentum is transferred to the spacecraft, gradually accelerating it through space. While the push from photons is miniscule, it is continuous and unlimited. Solar sails can eventually reach greater speeds than those obtained from chemical rockets. Bill Nye (The Science Guy), CEO at The Planetary Society, witnessed the launch on site among Planetary Society staff and members. This first LightSail mission is designed to test the spacecraft’s critical systems, including the deployment sequence for the Mylar solar sail, which measures 32 square meters (344 square feet). NASA is considering the use of solar sails on future exploration mission secondary payloads, and data from this mission will advance understanding of this form of propulsion. During the next month, the LightSail team will receive data from the satellite in space. As part of its agreement with NASA, the Planetary Society will provide the agency a report on outcomes and scientific findings. “Let’s see if we can give space exploration a strong nudge and change the world a little bit,” said Nye. NASA selected LightSail as part of the agency’s CubeSat Launch Initiative, which provides opportunities for small satellites to fly as auxiliary payloads on planned missions. It was assigned to a launch as part of as the 11th installment of the Educational Launch of Nanosatellite (ELaNa) mission. Since its inception in 2010, the CubeSat Launch Initiative has selected 110 CubeSats primarily from educational and government institutions around the United States. NASA will announce the next call for proposals in August 2015. Today’s mission was launched aboard an Atlas V 501 configuration Evolved Expendable Launch Vehicle (EELV) , which includes a 5.4-meter-diameter payload fairing. The Atlas booster for this mission was powered by the RD AMROSS RD-180 engine, and the Centaur upper stage was powered by the Aerojet Rocketdyne RL10C-1 engine. This is ULA’s fifth launch in 2015 and the 96th successful launch since the company was formed in December 2006.